The dwindling of fossil resources has prompted producers of fuels, fine chemicals, and polymers to switch from fossil carbon sources and search for renewable feedstock. Biomass holds one of the keys to this transition to a circular economy. 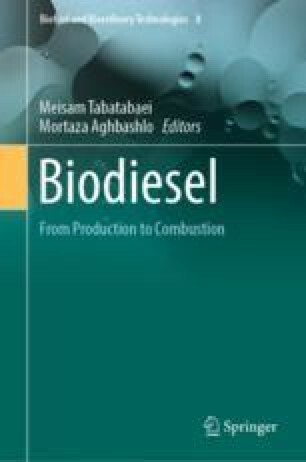 In this context, biodiesel obtained by transesterification of natural oils with alcohols is gaining importance in the fuel sector. Various reactor concepts have been developed for the transesterification reaction. Depending on the scale of the biodiesel production plant, reactors with varying designs are operated in the batch, semi-batch mode, or continuously. In this chapter, the optimal reactor technologies are analyzed with respect to the stages the chemical conversion runs through. The initial reaction mixture of natural oil and methanol, the most common alcohol in biodiesel production, is characterized by a liquid–liquid two-phase system. The high polarity difference of natural oil and methanol leads to a mixability gap and formation of a natural oil-rich phase and a methanol-rich phase. The mass transfer of the reagents across the phase boundary is slow relative to the chemical reaction, thereby resulting in diffusion limitations. Various mixing technologies, such as sonication, and the use of microreactors are explored to overcome these diffusion limitations. Once the reaction is 15–20% complete, the reaction mixture becomes homogeneous, reducing the need for intensive mixing. As the reaction continues and higher conversions are obtained, the fatty acid methyl ester separates from glycerin. The two phases are separated and purified. Recent technologies for process intensification aim at enhancing mass and heat transfer at all stages of the reaction.